Yep, I’ve got something to say about these seemingly unrelated topics, and with all due respect, with no particular reference to John Steinbeck. So, on this day when I can’t quite get it together to leave my cabin because of how stormy it is outside, I think it’s best that I stay right here and say what I’ve got to say about cats and rats and mice and men. It’s a rainy and yes, mainlanders, cold day here in Puna, Hawaii. I’m not kidding. Ohsure, the fact that I don’t have walls in my cabin definitely makes it feel chillier. When I first told my sister that and before she saw my place, she thought I was doing something akin to living in a tent. While that’s nowhere near true, I really do live in a mostly screen cabin, with nothing approaching drywall. Tell me, what would we do with drywall here in Puna anyway? I’m especially thinking about that in the midst of yet another thunderous storm that’s drenched this entire day. This entire day. I’ve never experienced a day of almost continuous thunder and lightening before, especially in a place that rarely has thunder and lightening. (Climate change is a liberal hoax, don’t you know.) But that’s been the day today, amid a week of wild and stormy weather. I heard that we had 12”of rain last week. One foot of rain. Unbelievable. There were some clear and gorgeous moments interspersed and even Hilo’s Black and White Night was mostly not rainy, an amazing truth in itself. But for now, I’ve survived yet another one of the loudest thunderstorms ever and directly, I mean directly over my head. It’s the perfect day for writing. The thermometer in the kitchen says something like 66 – 67°. I know, I know, that doesn’t sound cold. But it is and I am. I’m sitting here in long sweat pants, socks, a long sleeve shirt and a fleece jacket. And still, I’m cold. Take pity on me, please. What I really am, though, is sad. Really, really sad. About my kitty. And I don’t mean Pono. I’ve been home (yes, home) for almost three weeks. In that time, I’ve been adjusting to the truth that Pono is really gone and after so many months, not very likely to return. I’ve been thinking about him, looking at photos of him and remembering his sweet spirit, his tough and strong body and how he used to love to climb trees and roofs and just about anything there was to climb. Agile, powerful, sweet and cuddly, he always slept with me, even in-between his hunting hours. 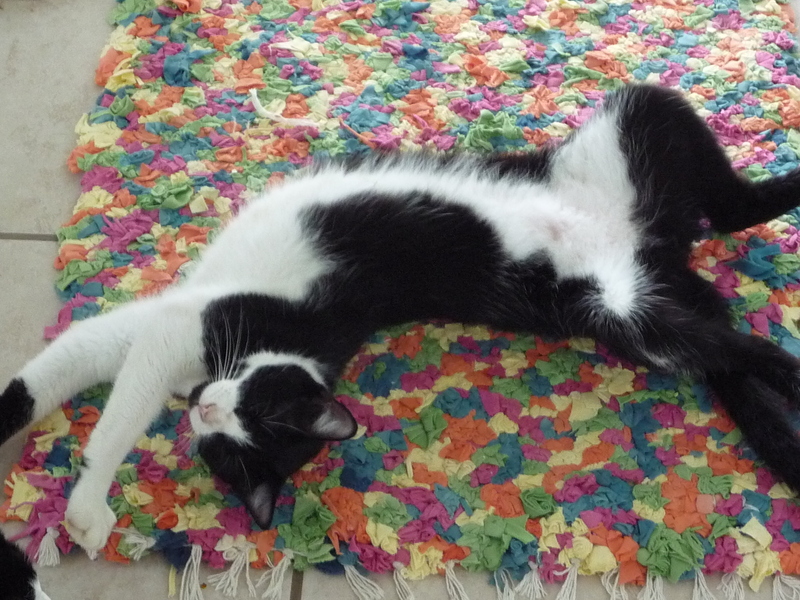 He was a yoga kitty like no other I’ve known – he loved to stretch his limbs as far and as wide as they would go. He would sprawl like that in the middle of the floor or the bed or wherever he felt like it. As my first male cat ever, he just might have been the most loving and affectionate one of all. I could hardly contain the tenderness he evoked. Pono really did make everything pono when he came into our lives, although he certainly didn’t do that with his disappearance. I miss him. Terribly. And while I’ve begun the all-important grieving process with him, it’s not him I’m talking about right now. Fortunately, Makana was here when I returned. It took her only a little while to warm up to me again after my many, many months away. I was grateful for this, as I’ve been shunned by the best of them when I’ve returned before and imagined it could be similar this time. No one knows how to shun better than kitties. But it wasn’t shunning I got at all – it was the kind of sweet lovin’ that Makana is known for. Even though all kitties are exceptional beings from where I sit, Makana’s always been one of the most extraordinary, from the very moment and way she arrived in my life. I wasn’t looking for a kitty, I didn’t even want a kitty. I mean it. And I certainly didn’t want a black and white one. 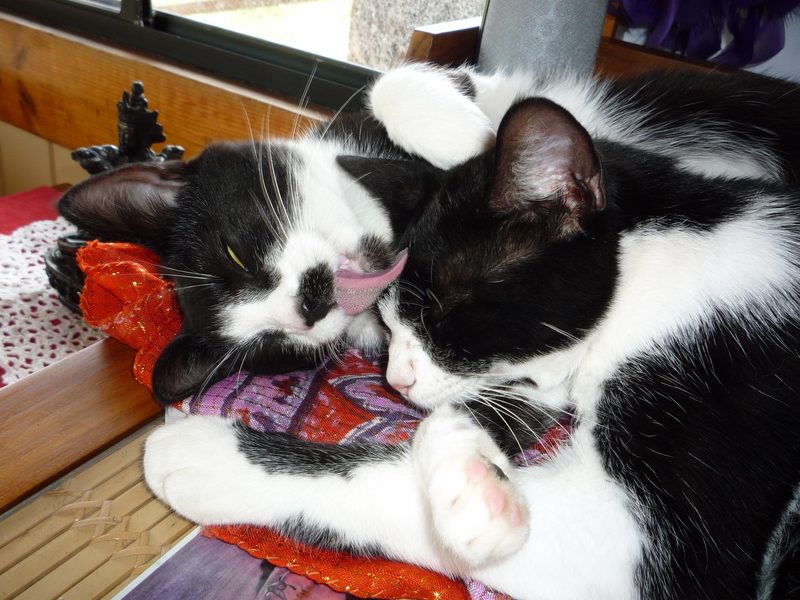 I was still in grief over the loss of my most recent kitty, Kosi, another black and white one, who died in only her second year, hit by a car in front of our home in Sebastopol. Yes, our home, the home of my marriage that was only recently over and which I was also grieving. Yeah, I was surrounded in grief and looking nowhere near an animal to bring into my life. But Makana didn’t know or care much about any of those emotional details. It just so happened (uh-huh) that she darted out into the middle of the road directly in front of my car as I was driving down the main street of the Seaview subdivision one Sunday morning. I was later than I had wanted to be in setting out to the market and other places, so as much as I ever am here in Hawaii, I was in a hurry. Just like life and a kitty to let me know my hurry was not such a priority after all. I slammed on the brakes, of course, worried I had hit her and jumped out of the car to figure out what had happened. I could hear her meowing but couldn’t see her until I got on the ground and looked up into the wheel well; and sure enough, there she was, sitting on top of the tire! And there I was, lying on the ground in the middle of the street, looking up into the sweet face of this tiny little kitty. She finally decided it was time to jump down and did so directly into the palm of my hand and began purring. Yep, she was small enough to fit into the palm of my hand, looking up at me and damn it, purring. What the hell was this all about? As if I didn’t know. I brought her home, put her on the front lanai of my house and gave her <she had me already, obviously> a bowl of something or another, certainly not cat food since I had none. I told her I had to go and that we’d talk later if she was still there when I got back. “If.” Right. She laughed behind my back after I drove away, I’m sure of it. And, no doubt, she made herself comfortable on the <ahem> little bed I had set up for her. Of course she was there when I returned. But still, I wasn’t convinced. I went back to the place in the road where she had found me and looked around for a mama kitty and her litter mates. None were to be found. It seems we were starting a family together. When it came time to choose her name, the Hawaiian word, Makana, came easily. Makana means gift, but not just any gift – a special gift, one of spirit and significance. It also means, I just learned, wild and untamed. Yep, that fits too. 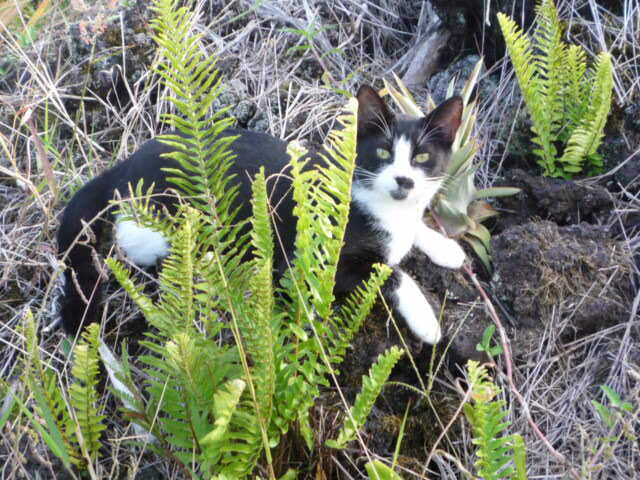 Makana is a special kitty in so many ways – she has an unusual physical trait – a head tilt which not only is a real and very rare (but benign) medical condition in cats, but also one that my most beloved kitty of all, Polly, had. How it is that I would have two kitties with a head tilt is beyond bizarre. Both Polly and Makana are the goofiest kitties I’ve ever known, so maybe their head tilts have something to do with that. A total aside – soon after Makana adopted me, I had a party and a friend of mine moved around the house, tilting all the art on the walls, he said, so that they were straight for Makana. Silly cats and silly friends I have. Makana also happens to be a special needs kitty. She’s been a fragile sort in her short, three-year life, what with almost-fatal kidney failure (saved with tons of love, a great vet and more money than I’ll ever add up) and her seeming lack of athletic ability and/or interest that’s not kept her out of harm’s way. Never thwarted, though, no matter how bruised and battered she’d get in fights, she kept prowling and exploring, disappearing in the wilderness of the nature around us sometimes for days. I thought many a time to keep her inside, but on the occasions I did, she seemed so unhappy that I simply couldn’t keep doing it. Who was I to stand in the way of that indomitable spirit? While she’s a wild one, she’s a wonky one, too and can be quite the homebody when she feels like it. It’s those crazy behaviors of hers that endear her to everyone and which melt my heart: the way she drinks out of the faucet, spoons me in bed, really, she spoons me. How she follows me into the bathroom, falls at my feet, purring and waiting (not very long) to be pet. And how she makes deep guttural growls of accomplishment when she brings her gifts into the house – a coqui frog, a gecko or a mouse. She’s so very proud. It’s how she comes when I call her; mostly, except when she doesn’t feel like it, which I also love about her. It’s how she bites me when she’s decided she’s had enough touch. It’s about how, unbelievably, she taught herself to pee in the toilet. That’s a sight I will simply never, ever forget. Makana has indeed been a makana in my life. But now she too is gone. And my heart is so sad in yet another process of letting go. She disappeared sometime early on Friday after a wild night of storms during which she stayed pretty close to me in our bed. I’ve walked the land every day since then, calling her name and letting the neighbors know she’s gone; but there’s been no sight of her. Yep, she’s taken off before, I know. And each time, I think she’s really gone and then she struts back in as if it’s just another day, looking worse for wear or not, but wondering what all the fanfare and hoopla is about and why I’m fawning over her even more than usual. But this time feels different. With every clap of thunder and every pouring squall, my heart hurts more and I wonder how she could possibly survive out there. I’m open, oh, I’m so open to her crawling right back through the cat door at any moment. I’m just not counting on it this time. I’m too busy crying. So here I sit now without both of them. These kitties were the first ones I’ve ever had on my own and that made our relationship different, closer somehow. Their sweet little selves took up so much space in the house, no matter if they were sleeping or playing, their energy was so present, so present. As delighted as I’ve been to be surrounded with it, I’m now just as saddened to sit in the hollow silence of its absence. It doesn't get any sweeter. Or ... maybe it does! Even as I grieve them both now, I feel so grateful that Makana was here for these two weeks and that there was a quality of such sweetness in our contact. Especially in the last few days, she was hanging out more than usual – sleeping on the windowsills, playing in the kitty tunnel and drinking, of course, out of the faucet. She came to me throughout the day, fell at my feet and waited for my appropriate response, which she always, always got. The preciousness of these moments grow with every day she’s gone. I still fill her food bowl every day and when I did it today, I wondered, “how long does a person keep feeding a cat who doesn’t live here anymore?” I don’t know; I guess I’ll know when I know. My sleep has been terribly interrupted since she’s been gone. It’s not only that I’m holding the vigilance of ears wide open waiting and hoping to hear the pitter patter of her paws climbing up the steps of the loft, like a new mother listening for the comforting sounds of her infant in the next room. It’s that the sounds that come in the middle of the night are the pitter-patter of a different sort – now it’s the scrambling of rats and mice running through the cabin. I’ve never heard these sounds here before and even though I know there was a big problem with these critters while I was away, I haven’t seen them since I got back. But all that changed the first night Makana was gone. There I was, in the middle of the pitch-black night, wide-awake, looking for Makana and seeing rats bigger than I care to describe scurrying around the kitchen and across the sills of the loft, wayyy too close to where I’m laying my head – the nightmare of her disappearance made all the more horrible. Disgusting. Absolutely disgusting. Somehow, they got word that the watch kitty was gone and they came back immediately and in droves. Makana brought one up into the loft the other night, a mouse, that is, and a dead one at that. I promptly carried it downstairs and outside. Even though that wasn’t the most delightful experience, still, I’d much prefer her continuing to deliver the dead ones than having her gone and live rats in my midst. What is it with the disgust factor around rats? What makes them so gross? Maybe it’s that nasty historical thing called the plague and the vile filth and disease they conjure up. But as I was looking at them the other night (what else is there to do in the middle of the night anyway?! ), I thought that really, they’re not so bad looking – they just look like really big mice. And the dead mouse from the other night was actually pretty cute in its own mouse sort of way. Believe me, I’m not getting all sentimental about the mice and rats. I want them out of my house and now, but at the same time, I’m trying not to get totally overwhelmed with the creep factor. Good news is that I’ve found a few of their entry points and I’ve closed them down. Still, they came back, so I have more work to do; but I will not be daunted, nor will I live with them. But I do need to get some solid sleep and soon. If only Makana would come home. Okay, so I’ve covered cats and rats and mice. That leaves me with just one topic left – men. Ahhh, men. Is that like Amen? Kinda sorta. But I’m not much in the mood for praying at the moment, or at least not about men. But maybe I oughta give that a second thought. My heart feels heavy and weary. I’ve put myself out there and opened myself over and over and over in the cause and pursuit of intimate connection. There are no complaints here, lest you think I’m whining about it, because I’m not. I’m just saying what’s so. And I feel a bit worn, like the warrior feels after numerous battles, I imagine. I planned some respite from it all; really, I did and I meant it. But then Mr. Almost-Perfectly Wonderful came along. He more than came along – we were swept up into the throes of something no less than the delicious, heart-thumping, life force energy of Eros. And I’m not someone to say no to that force of nature. But no matter, there are other considerations and now we can go no further. Our plan was to meet yesterday. I wanted to come together and talk about this amazing connection, even for one last time and even if it had to end. I began to have my doubts, though, about whether I could pull that off. Just talk. Yeah, a week had passed, but it did little to dampen the irresistible energetic pull I knew he still felt, too. Maybe it wasn’t a good idea after all, but still, I wanted to go ahead with it. But he didn’t. We talked on the phone and that was simply as close as he could get, he said. It would be too hard to resist each other in person – he knew it and I knew it – and I knew he spoke the truth. He wishes, oh how he wishes, that things could be different. But they’re not and he simply cannot continue with me. Not until and unless he gets clarity about the rest of his life. Not now, maybe not ever. I get it. Really I do. I even agree with it and respect it and his integrity. I shared his pain as he spoke of his struggles and guilt. I can know it’s the ‘right’ thing to do and yet still feel the ache of sorrow and sadness at having to walk away from this kind of energy showing up in my life. And that’s right where I am in this moment, feeling the intensity of all of that as I grieve the loss of both of my cats. I’ll do this gracefully, really I will. Our paths will cross, there’s no way to avoid that with the common circles in which we move here in Puna. “What do I do when I see you?” I asked him. “Greet me with a hug and a kiss, I hope.” I will repeat this as many times as I need to – I will do this gracefully. I think about the two men who’ve come into my life over these last months. Rob in California with whom I shared off-the-charts synchronicity of common values, interests, lifestyles and activities, but little in the way of potent chemistry. And now, Mr. Almost-Perfectly Wonderful, with whom I share the most potent chemistry imaginable but with whom I can’t pursue anything else. One of them decided he couldn’t continue with me because there was little or no chemistry, the other because there was too much chemistry. <Big, deep sigh> So it is. Truth is, I agree with them both. And oh yeah, of course, ultimately I trust the process and know, somewhere in me, that all is well. But I’m too psychologically oriented for that to be consolation. I don’t even want to be consoled. I want to feel my feelings. So I sit here in my cabin, without Pono, without Makana and definitely without Mr. Almost-Perfectly Wonderful, feeling my feelings. I sit here alone, distracted by the noises the rats are making and hoping they’re not finding their way back in tonight. I wonder about these rats. I wonder how it is that they’re the ones here with me and not anyone else. Maybe I should look them up in the Medicine Book of Animals. Maybe they have some special powers I should know about. Maybe it will turn out that they’re my Power Animals, my Aumakuas, my guardians. Or maybe I should realize that I’m probably delirious with sadness and sleep-deprivation and find my way to some serious sleep. This entry was posted in Back in Puna. Bookmark the permalink. Oh, how I pray for Makana’s return. I am holding you, dear. Thanks, Amy – appreciate it very much! This is just heartbreaking. I’m just still feeling so certain she’s coming home again, not really sure why, and I doubt that’s very comforting to you in the midst of the emptiness you feel with both your kitties gone right now. Sending you lots of love and warm hugs. Thanks for the love & hugs – I’ll do my best to get rid of these rats before you get here!! 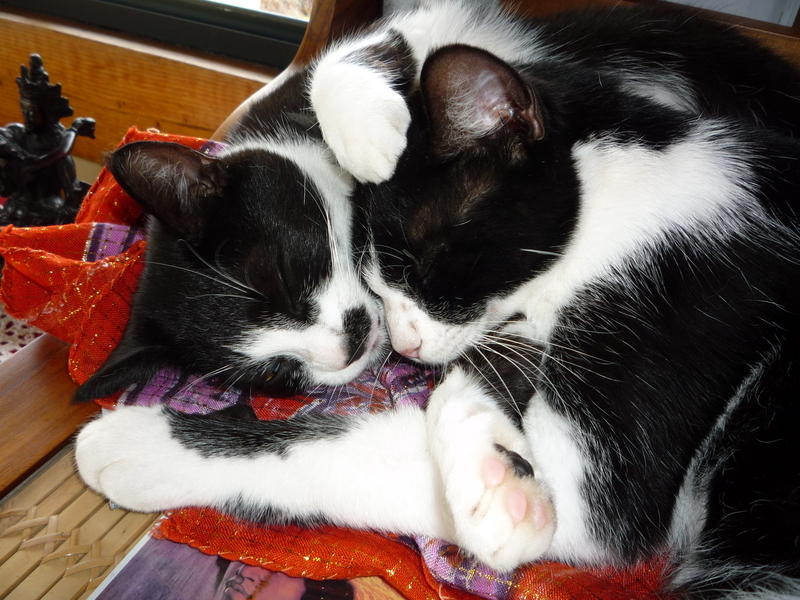 You expressed the joy, as well as the heart break, that our precious cats bring to our lives. I’m hoping your little Makana comes home soon.